Driving past Broadway roundabout on Wednesday, it looked like preparations were finally underway to build RISE, Wolfgang Buttresses' winning sculpture that will sit nearly 40m tall and consist of a mesh sphere suspended inside a larger outer sphere. There was consternation in January when no one turned up at a local consultation event on the Falls to discuss the new piece of public art which will dominate the view as motorists travel up the M1 into the city. I spoke to Wolfgang Buttress back in November when he described his thinking behind RISE in this video. 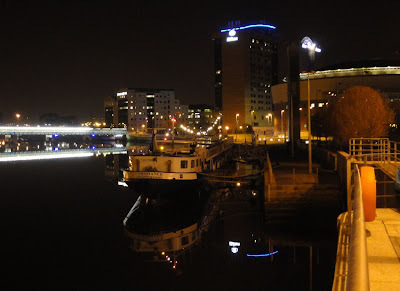 The River Lagan seemed incredibly still last Wednesday evening as I walked back from TEDxBelfast at the Belfast Harbour Commissioner's headquarters to find my car. Rather than cross-post the whole thing, I refer you to a post I published over on Slugger last night. It looked at the publication of the report into educational underachievement and disadvantaged protestant males by Dawn Purvis and her independent working group. Protestant educational underachievement has been a much talked about situation over the years: generational unemployment, last of aspiration, lack of positive role models on top of the Troubles legacy, poverty, deprivation and family breakdown. Statistics bounce around the media about the low number of boys on the Shankill Road passing their 11 plus or gaining university places. The set of reports and associated consultation reports and research has pulled together the figures along with consultation responses from individuals, education boards, teachers, academics and voluntary organisations. 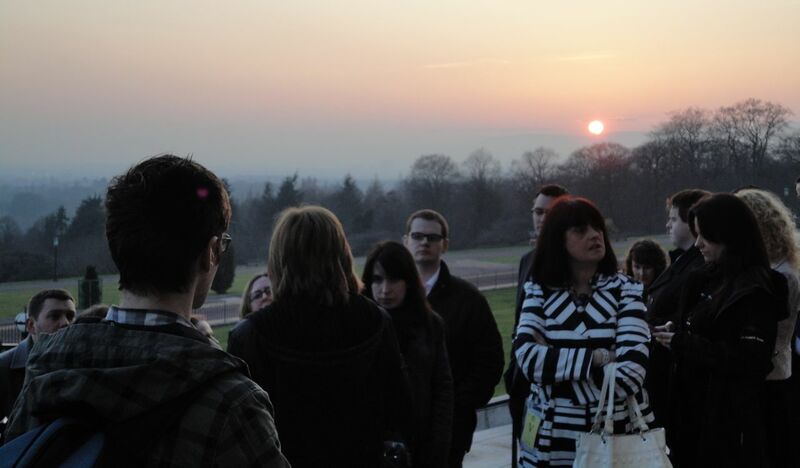 First-hand experiences from a focus group of Protestant teenagers was also considered. 24% of children in NI live below the poverty line with 10% living in severe poverty? children in NI are more than twice as likely to be living in persistent poverty as in the rest of the UK? 8% of boys aged <15 have a disability, compared with 4% of girls? 24% of working age adults in NI (in 2006) possessed no qualifications (in England the figure was 14%)? socially disadvantaged Catholics perform better than their Protestant counterparts [in non-grammar schools], whereas grammar schools pupils have more similar educational profiles? at GCSE English and Math, 15% of Controlled schools are under-performing, as against 4% of Catholic Maintained school? The final report - a "Call to Action" - along with the preceding consultation document and response summary are all well worth reading to get a handle on the state of Ni's education system. There is one group that has delivered for the kids that are destined to underachieve and that is the group that day by day delivers on time, every time. The dinner ladies. Would dinner ladies abandon school meals without preparing a contingency? No. Do dinner ladies treat the FSM kids inequitably? No. Could dinner ladies organise the school holidays better? Yes, you bet they could. Dinner ladies – what would we do without them? On Wednesday evening, Belfast Harbour Commissioners’ headquarters was full of ideas and creativity as Belfast’s first ever independently-organised TEDx event brought together six speakers, one orchestra and the lucky 100 ticket holders. Davy Sims had been planning the event for six months or more. I’ll update this post when the full talks are uploaded shortly to the TEDxBelfast.com website. 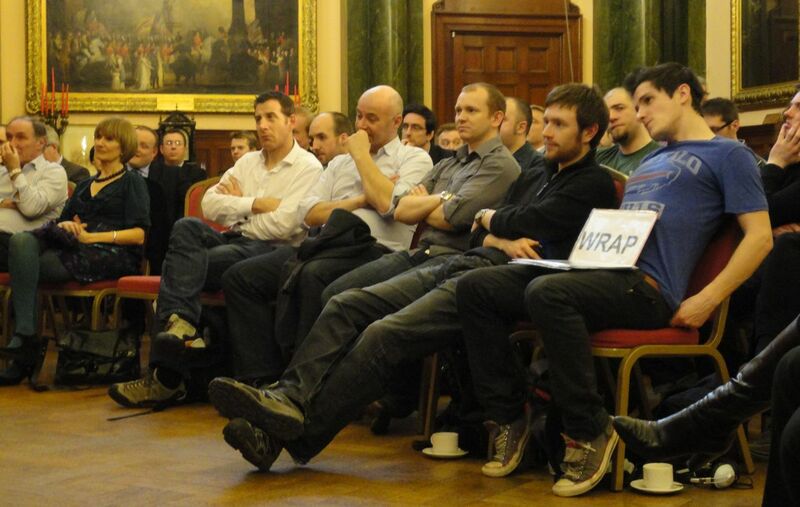 In the meantime, I caught up with the speakers to get a flavour of what they’d been talking about. Sinclair Stockman was first up, taking the subject of A Fully Interactive World. He took a look at a number of very ancient technological advances in early postal and communication systems. Sinclair was taken with the vastly distributed (though low volume!) postal system set up in the time of Genghis Khan. He pointed to infrastructure sometimes getting in the way of efficiency. Sinclair said it was criminal that while Northern Ireland probably has the best broadband network of any territory its size in the world, yet we have 20,000 illiterate children. Biomimicrist Ken Thompson spoke about Seven Secrets of High Performing Teams. To be honest, at times it came across like a précis of his book. But in amongst the management speak and the jargon, there were some nuggets of advice for people organising and operating teams. How often does the simple lack of clear ground rules cause disruption and conflict in projects? His sixth “secret” was “Fast co-invention”. There’s room for command and control “leader decides” management, and there are occasions when wisdom of the crowds copes well when no specialist knowledge is required. But sometimes it’s a matter of figuring out who is most expert on a subject in a team and give them the responsibility to decide of those matters. 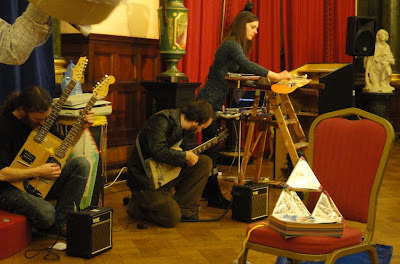 Just before a short break for refreshments and serendipitous networking, The Really Rubbish Orchestra demonstrated what was possible with handmade instruments made from reclaimed rubbish: an electric guitar made from a couple of lab stools, various stringed creations based on skateboards mounted on a wooden ladder complete with wobbling spoons! Maureen Piggot, director of Mencap in Northern Ireland, was a revelation. She provided a window into a world of which I’m mostly ignorant. His talk dovetailed well with the one from Ken Thompson. Instead of employees continuing to arrive at work with long faces, he suggested that more democratic workplaces would offer greater employee satisfaction, productivity and results for their employers. He cited examples where senior managers had become facilitators, where HR policies had been thrown out the window, and where workplace democracy had led to sustainable growth. While I wish there had been more time at the end of the evening for attendees to mill around and discuss what they’d heard and been challenged by, it was an excellently curated event with a good range of talks. It also avoided buffer overload by providing space to mull over the ideas rather than being constantly bombarded with more. In the spirit of Ruth Morrow’s challenge to “make mad ideas sane”, I look forward to Davy applying to organise a follow-up TEDxBelfast in 2012! Update - three of the TEDxBelfast talks are now available online. The 5th annual Polish Film Festival – Kinoteka –is squeezing in before the larger Belfast Film Festival at the end of the month. Running from Friday 25 to Thursday 31 March, the QFT will show a different Polish film each night. Friday night’s opening film is sure to be popular. Essential Killing is an allegorical tale about a man captured by US forces in Afghanistan and subject to interrogation and rendition. 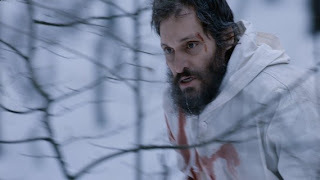 In the course of his journey through an unnamed European country, he escapes and is pursued across an uninhabitable snow-covered landscape. What follows is a game of survival, pitting one man against the elements in a heroic battle to stay alive. Written and directed by Jerzy Skolimowski, the film won the Special Jury Prize and Best Actor awards at the 2010 Venice Film Festival. Saturday’s screening of Wonderful Summer takes a more light-hearted subject: a comedy about a stonemason’s daughter with extraordinary abilities to communicate with the dead! The final film – Made in Poland – is “a gritty angry statement on youthful radicalism adapted from a highly successful stage play” in which a rebellions young man searches for guidance and authority in the new post-Communist Poland, challenging his priest, his teacher and even local gangsters to show him the way … until love saves the day! Different languages and cultures offer varying lenses through which to view the world and common human experiences. Some European cinematic treats not to be missed! 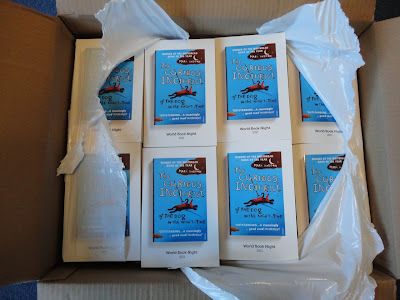 It's been great to find out that at least one of the 48 copies of The Curious Incident of the Dog in the Night-time I gave out as part of World Book Night has been passed on and is being enjoyed by another reader. 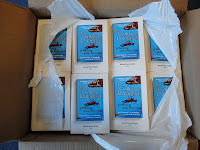 The Bookseller today reported that the distribution of 40,000 free copies of the 25 books had actually boosted the year-on-year sales of the titles. Sales of the 25 titles given away as freebies on World Book Night continue to confound the critics, as the public snap up the selections at three times the rate in March this year as they did last year, on average. In total, the 25 World Book Night titles have sold 58,100 copies thus far in March, with the average year-on-year sales increase for each title measuring 205%. Approximately £78,000 more has been spent on the books over the past two weeks than in the comparative weeks last year. The inaugural event added approximately 75,000 extra sales to each title, according to The Bookseller.com. Sometimes I wonder why Roads Service construct such long slip roads to allow drivers to join the M1? 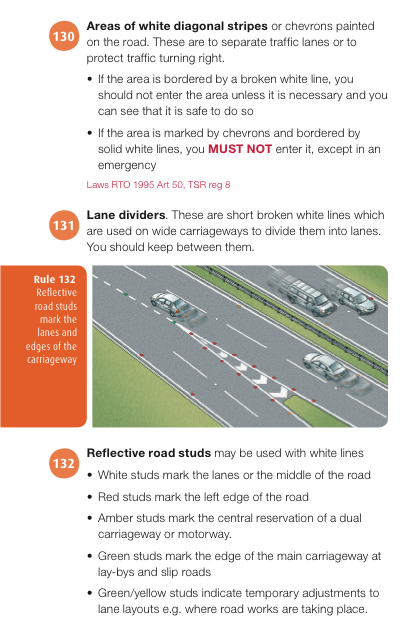 Instead of steadily driving along the full length of the slip road and being able to pull out into the inside lane without braking and halting all the traffic behind them, every night on the way home there seems to be a race to see who can get off the Stockman's Lane slip road and onto the south bound M1 the earliest. 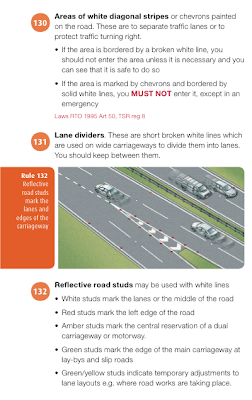 Tonight, faced with at least a third of a mile of slip road in front of him, one particular 4x4 driver decided to pull off the slip road and cross over the solid white line and over the chevrons to join the inside lane of the M1. Annoyed that I wouldn't immediately come to a stop and let him in, he wound down his window to tell me that the Highway Code allowed him to drive over chevrons. Well, not in any copy that's been printed in the last 20 years! So this post's just for him. 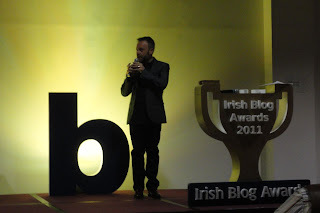 On Saturday night the Irish Blog Awards travelled north to Belfast and the Europa Hotel. Rick O’Shea steered the crowd gathered in the ground floor conference hall through the umpteen categories while Rev Jesse Jackson addressed victims and survivors of the troubles up in the twelfth floor suite. Glass trophies were handed out; but unfortunately, many of the category winners weren’t in the room to receive their awards. And everyone got to take home polystyrene mementos of the evening, as well as the spare sugary treats from Curious Cupcakes. Arsenal-focussed sporting blog arseblog.com won the overall 2011 Best Blog prize. Of local interest, Manuel the Waiter got huge cheers as he picked up the Best Humour Blog award for Well Done Fillet. 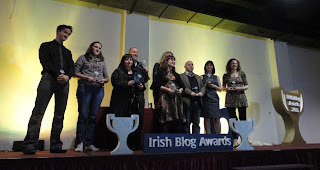 June Caldwell picked up a very well deserved Best Blog Post award for her piece on depression – Being depressed just means you’re not a moron – dedicating the win to the other writers at the excellent group blog The Anti-Room. Cedar Lounge Revolution beat Slugger O'Toole to the Best Political Blog award. Dylan Haskins triumphed over shortlisted local Minister of Culture, Arts & Leisure Nelson McCausland to win Best Blog of a Politician. Damien Mulley, the driving force behind the six years of awards, explained at the close of the ceremony that this would be the last IBAs he’d be organising. 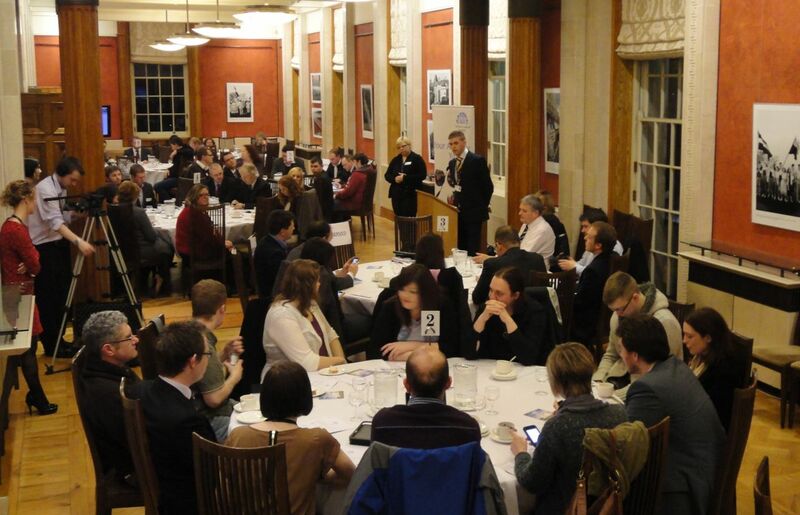 On the back of a conference addressing human trafficking in Northern Ireland, Contemporary Christianity will be holding their monthly In Conversation event in East Belfast on Tuesday night. Dr Lauran Bethell is an international consultant on the issue of Human Trafficking. Over twenty years ago she went to Thailand with an American Baptist mission agency to teach in a mission school but quickly became involved in the rescue and care of young women who have been exploited and abused. She pioneered projects in Thailand and directed a centre for ‘at risk’ girls. The New Life Centre has received international recognition and awards for its work. Lauran’s main concern is to initiate and encourage new grass-roots projects, particularly among churches and Christian groups, addressing the exploitation and abuse of women and children. The daytime conference is sponsored by The Department of Justice under their Blue Blindfold Campaign, and facilitated by the Irish Baptist Network. As well as Lauran Bethell, participants will include representatives from PSNI, Migrant Help, Women's Aid NI and others from the community, voluntary and faith sectors. Conference places are now full. However, the evening event at 7.30pm with Dr Lauran Bethell is free, open to the public, and no registration is necessary. 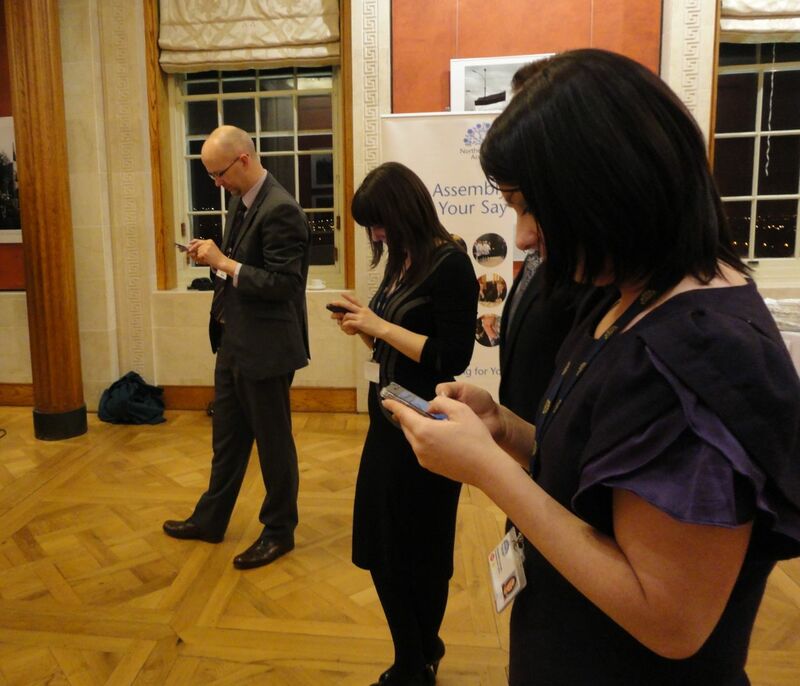 Hats off to the NI Assembly engagement team who welcomed photographers, bloggers, facebookers, tweeters and other social media hangers-on to tour Parliament Buildings this evening for what they badged as a Tweet-Up, "the first legislature in the UK and Ireland to host a social networking event". While some of the participants were familiar with the NI Assembly and the folks on the hill, for many others it was their first opportunity to see around and find out where the local administration is based and how it works. After a comprehensive tour - which can be arranged free of charge throughout the year - Assembly staff, MLAs, party researchers and media all happily explained their roles and answered questions. The Assembly Library was quite a revelation. There's an enormous collection of Irish political literature, including an extensive biography section. 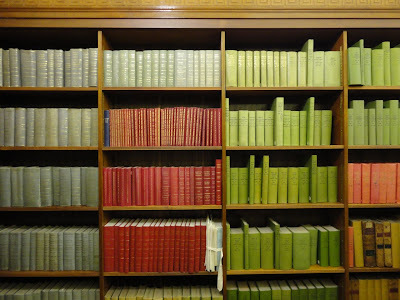 In an annex, papers from previous NI parliaments were neatly stacked in bookcases. While it was a great chance for face-to-face conversations and catching up with old friends, some folk couldn't resist the lure of their online worlds! Belfast Film Festival has released it programme with back to back films showing during the fifteen day festival running from 31 March to 14 April. Last year’s festival featured some excellent films. I’ve listed some highlights below that stand out from a first quick flick through this year’s programme. Thursday 31 March at 7pm – Locally shot Killing Bono is opening the festival and is sure to sell out quickly. Saturday 2 April at 3.30pm – Dougal and the Blue Cat is the English language dub of the 1972 French film based on The Magic Roundabout. Dougal is watching the every move of Buxton, the snarky blue cat who is visiting the garden. Sunday 3 April at 2pm – Doctor Who fans will want to book their free ticket [not yet available at time of posting] for the showing of the classic Tom Baker story City of Death which is showing in BBC Broadcasting House. Sunday 3 April at 5pm – Beijing Taxi follows on from last year’s Chinese cinema season at the Belfast Film Festival. Follow the lives of three Beijing taxi drivers in the run up to the 2008 Olympics. Monday 4 April at 7pm – Sound of Noise is a Swedish comedy in which an anarchic band of musical malcontents break into public buildings to play compositions using the surroundings as their instruments. But then they attract the attention of the tone-deaf policeman son of a famous musical family. Thursday 7 April at 7pm – Matching Jack looks at complicated and frayed family relationships and the bond between a parent and her sick child. Stars James Nesbitt. Sunday 10- Tuesday 12 April at 7.30pm – Raiders of the Lost Story Arc is an original drama created and directed by Stephen Hackett and Paula McFetridge – a collaboration between Belfast Film Festival and Kabosh. Imagine the scene: “in 1978 three bearded men called Steven Spielberg, George Lucas and Lawrence Kasdan met in room somewhere in LA. For 5 days they talked, after 5 days they had their story straight. Raiders of the Lost Ark was born”. Performed by Paul Kennedy, Frankie McCafferty and Alan McKee. Monday 11 April at 9.15pm – How I Ended This Summer is set in a remote polar station where the cast of two are isolated together for months on end. An important radio message arrives, followed by fear, lies and suspicions start poisoning the atmosphere in this tense film. Wednesday 13 April at 7pm – Build Something Modern is a documentary looking at Irish architects in the 1950s, 60s and 70s. Special preview screening in the Ulster Museum. Wednesday 13 April at 7pm – TT3D takes a three dimensional look at the thrills and spills of the Isle of Man TT race. Belfast Film Festival organisers have branched out this year with a festival podcast this year [podcast feed]. Cathedral Quarter Arts Festival is back for the 12th year. This year it runs between 28 April and 8 May. While the full programme won’t be released until 30 March, the organisers have released some details and tickets in advance. 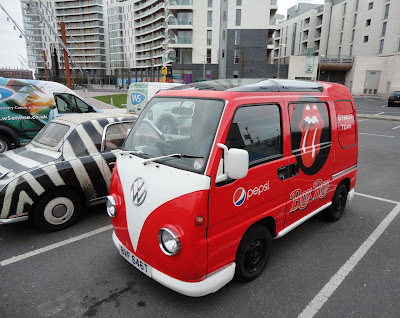 I really doubt this van was manufactured by Volkswagen ... but it's still cute. Western society consumes a lot of digital media. While there’s a niche market for retro technology, VHS video tapes, 35mm film and even CDs are out. A couple of weeks ago I posted about the announcement that the original UK Tivo set top boxes will be ceasing to work properly from 1 June 2011. I’ll come back to home media solutions soon in another post, but one upshot of all this media production and consumption is that we need a lot of digital storage to hold it. 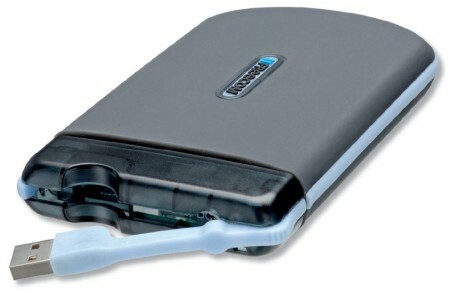 About three years ago, I purchased a portable hard drive: a Freecom ToughDrive Pro. 80GB of storage wrapped in a rubbery case that promised to replicate my work laptop’s files and protect my data from the knocks and bangs of being flung about in my backpack. It has lasted well, and I still marvel at it’s flexible USB cable that folds into the casing. Recently as part of testing their GoFlex TV home media player, Seagate kindly sent a couple of portable drives. One was a matching FreeAgent GoFlex 320GB unit. The other was a 1TB GoFlex For Mac drive, preformatted with HFS+. Hasn’t the world moved on from the days when 80GB was as much storage as you could afford to fit in your pocket? The FreeAgent GoFlex 320GB drive is aimed at PC users, and comes pre-formatted NTFS. Apple Macs can natively read NTFS. So it was nice to see that the drive came pre-loaded with a Mac NTFS driver that once installed allows you to write to NTFS drives from your Mac. Bonus! Of course, you can quickly reformat the drive to a more suitable file system that better suits your purposes. 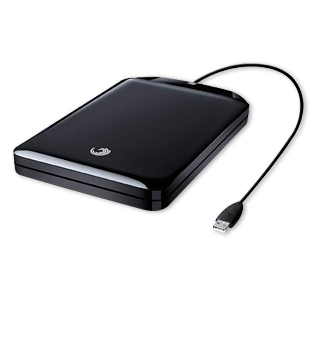 The 320GB drive is small – 11 cm x 8cm x 1.5cm – light, black and glossy. Cunningly, the USB2.0 connector section clips off from the back of the 2.5” drive, allowing you to swap it for optional FireWire 800 or USB3.0 connectors which should future proof it for some time to come! 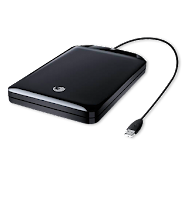 As well as functioning as an external drive, with the connector interface removed, it also neatly slots into a bay in Seagate’s media player or the network storage server to quickly load them with content. As I mentioned above, the Mac-specific drive came preformatted with Apple computers in mind. The 1TB GoFlex For Mac ultra-portable drive is a few millimetres thicker than its 320GB cousin. It’s less glossy – and hence doesn’t pick up your fingerprints! – and matches well with Apple’s brushed aluminium look. Seagate offer a Windows HFS+ driver for download to allow you to share it across Windows and OSX machines. But there’s also nothing to stop you reformatting it for NTFS or FAT if your needs change after you buy it. The Mac version is conveniently bundled with both USB2.0 and FireWire 800 interface connectors. USB3.0 is an optional extra. Speed wise it's no surprise that both Seagate drives performed faster than my 3 year old trust 80GB portable USB drive! I timed copying a 1.7GB video from my Mac Mini across to the HFS+ formatted drives (and back) and compared it with the old (non-Seagate) 80GB USB drive. While certainly not as scientific as a lab-based performance test - and limited by the speed of the Mac Mini's internal drive - it gives some idea of relative performance. Connected by USB2.0, the FreeAgent GoFlex 320GB was the fastest, writing the video to its disk in 75 seconds and sending it back to the Mac Mini in 59 seconds. Also connected by USB2.0, the larger 1TB GoFlex For Mac drive was marginally slower, consistently writing the file to disk in 78 seconds, and taking 56 seconds in the other direction. For comparison, my old 80GB USB drive took 105 seconds to write the video, and 68 seconds in the other direction. 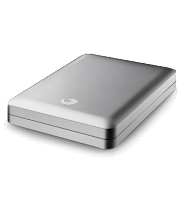 Both Seagate drives are a great size, and the ability to change the interface from USB2.0 to Firewire 800 and even USB3.0 means the drives should be usable long into the future … until storage needs dwarf today’s drive sizes! In the meantime, very impressive portable drives. Disclaimer - The kit mentioned in this post was offered and freely supplied by Seagate in return for a written review (which was emailed to them and forms the basis for this post). Since I was intrigued by the Seagate product range, I was happy to agree to look at the kit ... unlike some of the more bizarre review requests I sometimes find in my email inbox and turn down or ignore. As expected, it wasn't too difficult to hand out free books to people. There's something of value about a book meaning that strangers take the offer more seriously than if you were just thrusting a leaflet into their hand. They'll engage in conversation. They'll tell you that they're not much of a reader. They'll spontaneously promise to give a go. An email around work took care of about a third of them. Parents at the school gate got them along with those sitting around at Littl'un's swimming class. And anyone in a cafe - serving or seated - or in cinema box office was vulnerable to a quick chat that ended in being offered a book. One person has already come back to say that they've finished their copy - and enjoyed it. Hopefully they'll pass the book on and the cycle will begin once again. Brian Ervine emerged as the Progressive Unionist Party’s leader last year after Dawn Purvis quit in the aftermath of UVF members’ involvement in the murder of Bobby Moffett. I caught up with Brian in the PUP’s Newtownards Road office on Thursday afternoon. 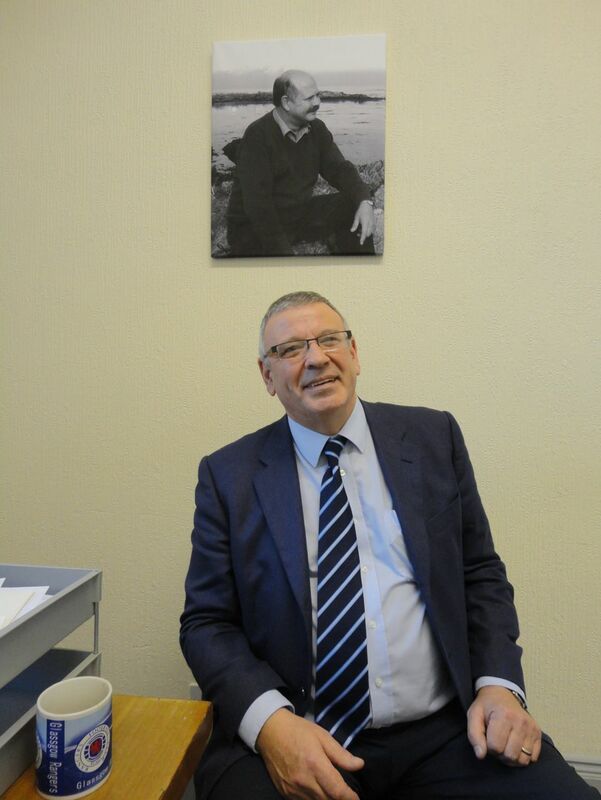 Serving in the shadow of his brother – and physically, sitting under a photo of David Ervine – he talked about his political beliefs, party policy, election hopes, and was happy to discuss the PUP’s relationship with the UVF and his impression on the UVF’s progress towards standing down. You can catch the full detail (and a transcript if you don't want to watch the video!) in a post over on Slugger O'Toole. TED talks are coming to Belfast later this month. The independently organised local events under the banner of TEDx share the same vision as its parent - "ideas worth spreading". 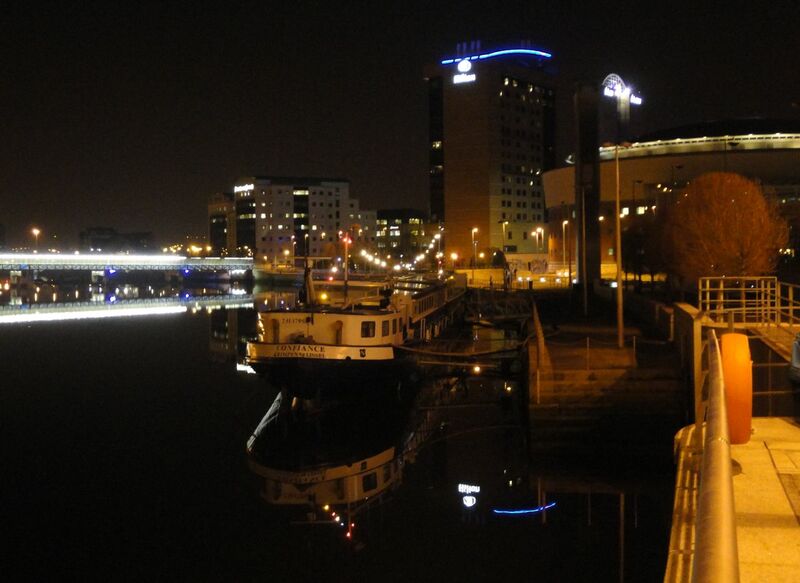 TEDx Belfast will take place at 4pm on Wednesday 23 March in Belfast Harbour Commissioner’s Office. Under the title of Creativity and the City, speakers with a connection to Belfast (and Northern Ireland) will deliver talks to stimulate thought and plant ideas about creativity, design, innovation, technology and entertainment. Davy Sims and his small team have assembled six great speakers, with the possibility of one more. A number of TED talks will be shown during the event. Tickets (£30) are limited to 100. Paul Moore :: Professor at University of Ulster's Head of School of Creative Arts. Member of Content Board Ofcom. Ruth Morrow :: Ruth is Professor of Architecture at Queen’s University Belfast. She has worked as an architect in the UK and Germany and taught at Schools of Architecture across the UK and Ireland. Her work tests the potentials between people, place, creativity and pedagogy and ranges across activist design pedagogies, urban activism and innovative product development. All her work is underpinned by an ethos of inclusivity and design excellence. She is co-founder of Tactility Factory, a spinout company that has developed award winning, innovative surfaces, combining concrete and textile technologies. Together with her co-founder Trish Belford they are known for their ability to make ‘mad ideas sane’. Sinclair Stockman :: Living and working in Belfast and Paris Sinclair is founder of Active Minds, Paris. Currently Sinclair works as an independent executive technology and transformation advisor, working with a number of innovative web service based companies, providing executive advice and also working on a number of innovative projects with global NGOs and in developing countries. Colin Williams :: Colin's TV production company Sixteen South is the creator of Sesame Tree, a co-production with Sesame Workshop in New York - and Big City Park, a co-production with BBC Scotland, which recently won an IFTA (Irish Film and Television) Award. Both series have been commissioned by CBeebies for UK broadcast in 2010. Mark Dowds :: from Northern Ireland now living in California, Mark is founder of BrainPark.com. Maureen Piggot :: Maueen is Director of MENCAP Northern Ireland and is leading the development of a social media space for people with learning disabilities. It's brilliant to see that Belfast (and NI more widely) taking the opportunity to celebrate itself and exclaim its own vision to the world. 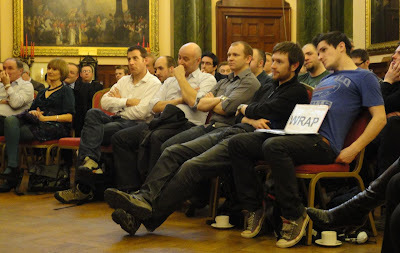 And since the talks will be videoed, the content will be available for a much wider audience afterwards. See the TEDxBelfast page, Facebook and ticket site for further details. Or follow their plans on Twitter. Thursday is World Book Day, and many school children will be issued with £1 voushers that can be used to purchase specially printed and discounted books in local bookstores. And on Saturday the UK and Ireland are celebrating World Book Night. Publishers, booksellers, libraries and broadcasters have teamed up to print 40,000 copies of 25 different titles, and 20,000 people are poised to give away 48 copies of their favourite book from the list. I picked up my box of The Curious Incident of the Dog in the Night-time on the way home from work, and will be handing them out in the Lisburn area over the weekend - hopefully to people who aren't in the habit of reading, or I reckon would particularly enjoy the great story by Mark Haddon. Despite 25 titles to choose from, The Curious Incident felt like the best choice. Accessible, practical, fun ... and not too long (or heavy). When signing for the books I noticed that I was the only one out of the 30 or more people around Lisburn on the pick-up list who had made that choice. In fact, most had settled for a small cluster of books: Seamus Heaney's New Selected Poems and John le Carré's The Spy Who Came in from the Cold seemed to be the most popular, and I was surprised that only one person had chosen Yann Martel's Life of Pi. So if you see me with giving stuff away around Lisburn at the weekend, stop and say hello. You might even get a book! And if you tune into BBC Two on Saturday night, you'll find an evening of bookish entertainment starting at 7.30pm. In an age when cuts mean that libraries are closing, putting books into people's hands seems like a great idea. 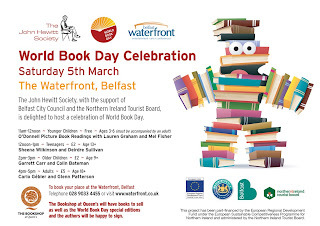 Update: The John Hewitt Society and Belfast City Council are running World Book Day celebrations in the Waterfront Hall on Saturday.